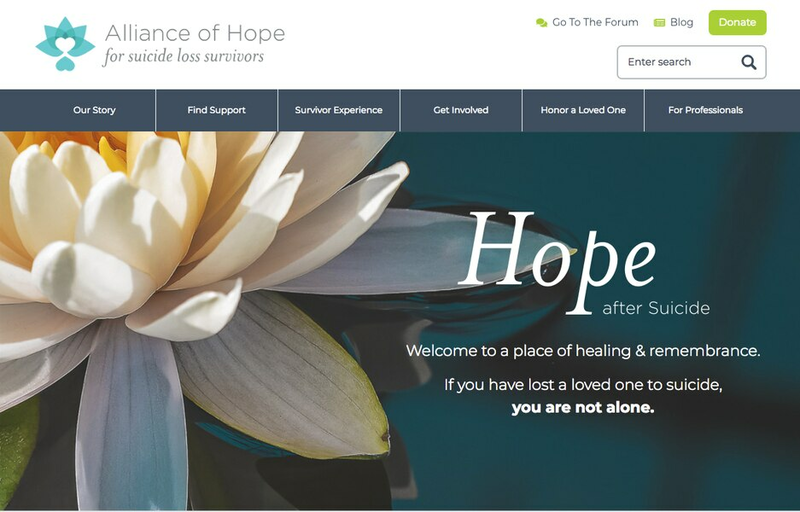 (Courtesy image) The homepage for the recently redesigned website for Alliance of Hope for Suicide Loss Survivors, a nonprofit that provides specialized support for people whose loved ones have died by suicide. When a person dies by suicide, those left behind are “catapulted on an emotional journey,” says Ronnie Walker, an advocate for survivors of suicide loss. Walker — whose stepson, Chan, a promising Stanford student who struggled with bipolar disorder and died by suicide at 21 in 1995 — said that when it happens, often the first kind stranger a family member encounters is the person arranging the funeral. “The grief is bigger than, say, the grief I felt when my mother passed [at 91],” said Walker, founder of Alliance of Hope for Suicide Loss Survivors, an online resource. She spoke at a seminar Tuesday during the National Funeral Directors Association’s international convention, held this week at the Salt Palace Convention Center in Salt Lake City. A suicide in the family can often make people feel anxious, agitated, numb, confused, sad or dissociated from what’s going on around them, Walker said. She cited statistics that people close to someone who has died by suicide are 10 times more likely to have suicidal thoughts than other people — and are 80 percent more likely to drop out of school or quit their job than those grieving over someone who died of natural causes. Soffe, who is a national spokesman for the convention, said his mortuary may handle around 40 suicide cases a year, among the 650 families for whom it provides funeral services. That number may be low, he said, because often the funeral director is at work before a medical examiner has made an official ruling if, for example, a drug overdose was accidental or deliberate. “There are times we don’t know the cause of death until the family walks in the door,” Soffe said. Walker asked people on the forums of Alliance of Hope’s website for comments to pass along to funeral directors, and most expressed gratitude for how directors handled the funeral. Some praised the funeral directors for their professionalism, their calm compassion, and for acting as a go-between for the media and badly behaved family members. The two suggestions suicide loss survivors made, Walker said, were to ask funeral directors to help decrease the stigma of suicide and to provide specific resources for suicide loss survivors — like the resources Walker’s nonprofit provides. Soffe said funeral directors understand they are dealing with families often at the lowest point in their lives.